Thoughts on relationships and life.. Most people don’t realize it, but the moon doesn’t technically orbit the earth. Instead, both the earth and moon orbit around their common center of mass. Admittedly, this center of mass is located within the earth, but that’s beside the point. In fact, because the moon is so large in proportion to the earth, the earth-moon system is sometimes considered a double planet and what affects one, affects the other. And both the earth and moon dance together around the sun. Our lives as a Christian married couple are much the same. They are intertwined, orbiting a common center and at the same time in a much larger orbit around God. We dance through life, sometimes in joy, others in mourning, all the while reflecting the light of God to our partner. To maintain this, though, one partner cannot have an excess of “gravity” in respect to the other, it must be a partnership of mutual respect and love. Only then can the marriage shrug off the pains and heartache afflicted by daily life. And our orbit about God provides additional benefits, as His influence steadies us and maintains our greater orbit about Him. The problems come when we allow other “planets” to perturb our orbits. If we allow these outside forces a greater influence on our orbit than our partner or God it’s all too easy for the delicate dance to be disrupted and for one (or both) of the partners to be stripped away. This is especially true when the partners’ mutual influence begins to wane and they draw apart, it becomes easy for another party to slip in and supercede one of the partners. Yesterday afternoon, the boy wanted a “popcircle” (Popsicle). We’ve been working on getting him to say “please” and “thank you” when asking for something, so when he came up and said “I wanna popcircle”, we said “say please”. Now, you or I would simply turn around and without really thinking about it say “I want a popsicle, please” and we’d get one. Not the boy, no way, no how was he going to say please. “I don’t wanna say please!”, “I wanna popcircle!”, accompanied by screaming, collapsing on the floor and just generally throwing a fit. And every time he’d scream “I wanna popcircle!”, we’d calmly tell him, “say please”, at which point a fresh round of screaming and flailing would ensue. This went on for a couple of hours (being a horrible father, I took video of him for a couple of minutes) and he never did say please. He also never got his “popcircle”. The point of this is, I wonder if sometimes God doesn’t feel like Kara and I did. He wants to give us good gifts and to bless us, but we just won’t ask in the right way. We refuse to say please (figuratively) and scream and throw ourselves on the floor when He doesn’t do things our way, right away. Maybe if we took to heart James 4:3 and stopped asking for things with the wrong motives, God would be willing to cheerfully grant our requests. So, the next time you’re asking God for something, examine your heart and determine why you’re really asking. And always say please. A lake without an outlet dies, think of the Dead Sea, Great Salt Lake or the Salton Sea. All that pours into it remains even as the water evaporates away, leaving only pollution and corruption fit for nothing. Even so a Christian must constantly pour themselves out to others and accept an inflow from God to cleanse the pollution of the world from their hearts. It hardly seems possible, but Kara and I just celebrated our third anniversary yesterday (July 21st). It seems as we’ve known each other forever, but also as though we’ve only been together for months. I suppose that’s the mark of a good relationship, eh? And now we have a beautiful 14 month old son who keeps us very busy as well. I took the day off work and we had a picnic and went geocaching. Kara had never been and it was fun, even in the rain. Timothy certainly enjoyed being out in the woods and we found some local parks we didn’t know about. It was just a nice relaxing day and we’re looking forward to many more anniversaries in the future. It was about one year ago today that Kara and I decided to move our wedding up by two months, from September 4th to July 21st. The stress of the planning and potentially putting up all the wedding guests was getting to both us and Kara’s mom, whose health wasn’t good in the first place, so we decided to just go ahead and get married. The next Thursday looked like it would work for both of us, so we announced it in church on Sunday morning and told everybody that there might be a small reception if we had time to pull it together. Well, the ladies of the church would have none of that, they told us not to worry about the reception and that they would take care of it. After church, however, it ocurred to me that we might have a problem. I realized that all my divorce decree was still in Boston and I didn’t know if Kara knew where hers was. And we needed them both to get our marriage license. More importantly, we needed them both by Wednesday afternoon, as New York has a twenty four hour “cooling off” period after you get your license before you can actually get married. So I checked with Kara and she kind of gasped and said that her paperwork was in a storage shed in Nebraska and there was no way to get it from there before Wednesday. That was a bit of a problem. So I hopped online (Google is your friend) and discovered that all the Iowa (where her divorce was filed) court records were online, however, for documents as old as hers, only the abstracts were available over the net. I grabbed the case numbers and filing numbers, along with the phone number of the court clerk and as soon as the clerk’s office opened Monday, gave them a call. Because I was had the information on the case, they were able to look it up, but were unable to send me a certified copy of the decree without a written request. Thank goodness for Fedex! I wrote up the request and overnighted it to them along with a self addressed envelope and airbill and asked them to send it back as soon as possible on Tuesday. Pretty much immediately after dropping that off at Fedex, I hit the road back to Boston to get my paperwork and any thing else I was going to need for the wedding. Tuesday morning I called the clerk’s office back and verified that they had received my package and that they would be able to get it sent out that day. They said it shouldn’t be a problem, so I spent the day getting my paperwork together and doing actual work for my job. About 4pm Iowa time, I called again and was told, to my horror, that while they had been able to pull the file, they hadn’t been able to get it shipped out! At this point I was a bit desperate, so I ask the clerk if she’d be able to drop the package in a Fedex box on her way home. She was agreeable to that, so I got onto the Fedex web site and found a drop box in her zip code, it just happened to be a the grocery store she was already planning to stop at on the way home! So I had my paperwork in hand, and Kara’s on the way, it was time to hit the road back to Cazenovia. When I arrived back in Caz, I checked the Fedex site again to make sure the package was on its way and was horrified to find out that, while yes, it was on its way and would arrive on Wednesday, it wouldn’t do so until after 4:30 pm, well after the town offices (where we needed to get the license) closed! This, despite having paid for delivery by 10:30 am. I called Fedex and got them to hold the package at the Syracuse office when it arrived there (early in the morning), rather than putting it on a truck for delivery to Caz, so the problem was solved. Wednesday, both Kara and I had to work, but I ran into Syracuse to get her divorce paperwork from Fedex and all was fine until about 3:30pm, which is when Kara should have been getting off work. I was supposed to meet her at the Caz town offices at 4:00 to get the marriage license (remember, we have to have the license before 7:00pm on Wednesday or we can’t get married Thursday). 4:00 rolls by, then 4:15, then 4:30 and no Kara and the town office is closing! I finally get a hold of her and find she was stuck in a case (she’s a surgical technician) and got out late. While waiting for here, I checked around the other town offices and discovered that the Manlius town office was open until 5:30pm, so I told her to meet me there, rather than in Caz. She agreed and I hit the road, planning to meet her at the Dunkin’ Donuts in Manlius. I get there and she’s there, but she’s discovered that the Manlius town office isn’t in the Village of Manlius, it’s actually in Fayetteville, about 5 miles to the east. So we jumped in the car and found the offices at about 5:20 pm and got inside just as they were closing up. Thankfully, the ladies in the office were nice enough to stay late for us and issue us a license, so we could get legally married Thursday. Thursday, the actual day of the wedding, was just a blur. Kara again had to work and wasn’t supposed to get off until after 3:00 pm, so I go the job of driving all over creation to pick things up, the tuxedoes, the rings, her wedding dress (another miracle, the seamstress was able to get it finished in time) and get back to Caz in time for the wedding. Kara’s job smiled on her and let her leave early (although there was a possibility that she would have to work Friday! Fortunately, that didn’t happen). We got the church decorated and the wedding went off without any other problems. Sunday marked the one year anniversary of Kara and I meeting in person for the first time. We met via eHarmony and had been communicating for a couple of weeks prior to our first meeting. At the time I lived in Boston, so I drove the five hours from Boston to Cazenovia to meet her for lunch. Once there, I found her parents were going to join us for a bit as well, which was fine with me (I’ve always gotten along well with parents :)). In any case, we had lunch, then went over to Chittenango Falls and hiked down to the base of the falls where we took a few pictures. The rest of the day was a bit of a blur, but I remember we went out to a church member’s farm to pray for her horse (the church member’s, not Kara’s). I stayed the night at the local motel and joined Kara and her family for church the next morning, then headed back to Boston, thoroughly twitterpated. It hardly seems that we’ve known each other such a short time, we connected almost immediately and feel as if we’ve known each other for years. It’s quite apparent to me that God had this all planned in advance, we just had to give Him the room to maneuver. So, after a year, I’m still twitterpated and can hardly wait to see what’s in store for the future. It’s never easy to lose someone. Yesterday, my wife and I lost our baby. Yes, the pregnancy was only seven weeks along and I know, intellectually, that at least 25% of first pregnancies end in a miscarriage in the first trimester, but it still hurts. However, we know that God works all things together for the good of them that love Him and are called according to His purpose. So, we’ll continue to trust Him and believe that He will grant us children when the time comes. Both Kara and I thank you for your support in this time. Ok, as a ridiculously proud father to be, here’s the first baby picture :). 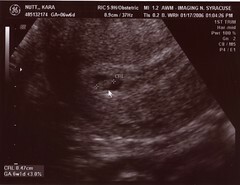 We had an ultrasound today and were able to both see and hear the baby’s heart beating. I have to say that this really makes it hit home, I’m going to be a father! I just pray that God grants me (and Kara!) the wisdom, strength and courage needed to undertake this truly awesome task.